Uncle Willoughby is training me to be a ninja. It’s very difficult, and I have to concentrate. Today I passed my first test. I managed to move myself from one place to another with nobody seeing me and no sign of how I did it! Uncle Willoughby will be so pleased with me (I hope). I was in my cage and run in the garden. Mummy makes the sides of my run very high these days because she’s been watching me climb over. That’s when I realised I had to take Willoughby’s lessons seriously because Mummy is very tricksy. This is how she set out our run today. You can click on the picture to make it bigger if you like. You can see me just going into the grey tunnel, and Dougall at the end, which is made up mainly of Colman & Kevin’s cage, which is taller than ours. 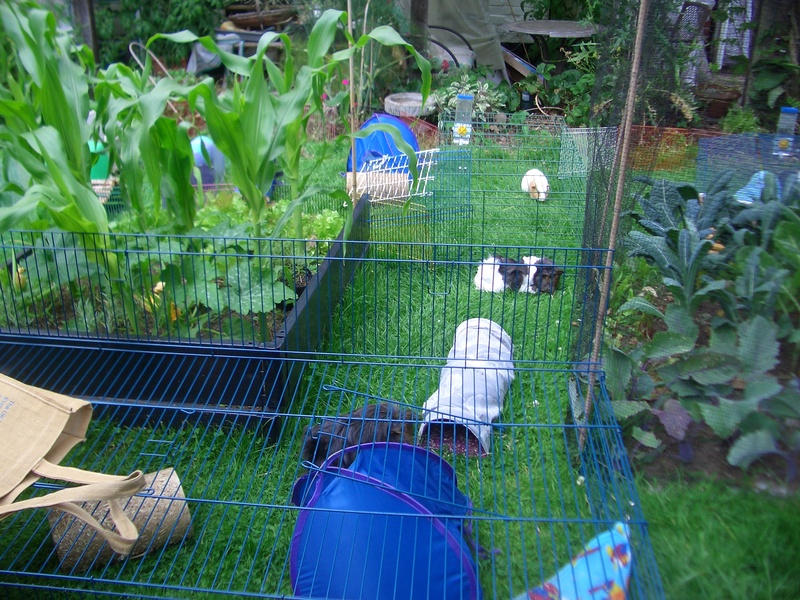 Mummy put a double height panel at the side of it to block the gap between the cage and the black flowerbed border (also double height) and there is some sort of netting thing fixed to the ground on the right. Mummy watched me check out the end of the run and the sides. I could see they were too high for me to climb, and the netting thing would only take me to Humphrey and Vic and they’re only fun if you’re desperate. So I went and thought about it and Mummy went to do things. When she came back I was in Colman and Kevin’s run where Kevin is in the picture 🙂 Mummy looked at all the places she thought I might have got through and couldn’t see any sign of how I did it. She said I must have squeezed underneath C&K’s cage top, but she’s wrong. I did it through ninja powers! Dyl, you cheeky smurf! I’d ask you how you did it, but I’m sure you wouldn’t tell me. The knowledge is for ninjas only. I was wondering why your uncle Willoughby was wearing a self-satisfied smile this morning. He’s evidently very proud of you. He’s popcorning all over the place. You know, Uncle Will is himself still a student of the late Grandmaster Ninja, whom you know as Uncle Mariusz. I’m sure you and Will have had many secret discussions of M’s technique. I think M is communicating with Will, but of course I’m not allowed to know how. Don’t tell Mummy I said this, but I’m proud of you, too, and am looking forward to more stories of your ninjutsu.